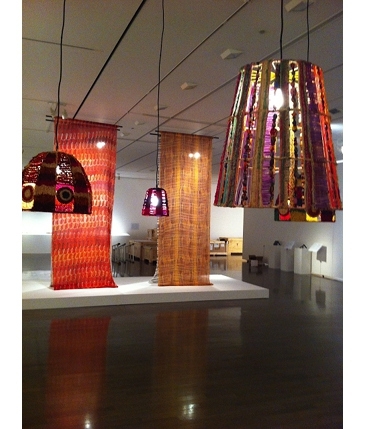 An exhibition of contemporary indigenous Australian craft has been on show this month at the beautiful 21st Century Museum of Contemporary Art in the historic and picturesque town of Kanazawa in Japan. The works have been collected via Sydney's Object Gallery curators and are Australia's contribution to the 2nd Tiennale of Kogei (Craft) and includes works representing Japan, Santa Fe (USA), Taiwan and Australia. Seen below are the gorgeous Yuta Badayala Pendant Lights, courtesy of Koskela in Sydney.